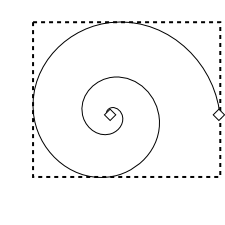 The Strumento Spirale can be used to draw Archimedes spirals. Other types of spirals can be drawn using the Function Plotter effect with polar coordinates. Select the tool by clicking on the icon (F9 or i) in the Casella degli Strumenti. 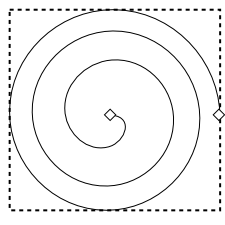 To draw a spiral, use a Left Mouse Drag. The start of the drag will be the spiral's center. Holding down the Ctrl key while dragging will constrain the position of the spiral end point to a multiple of the Scatto di angolo di rotazione (default 15 degrees). 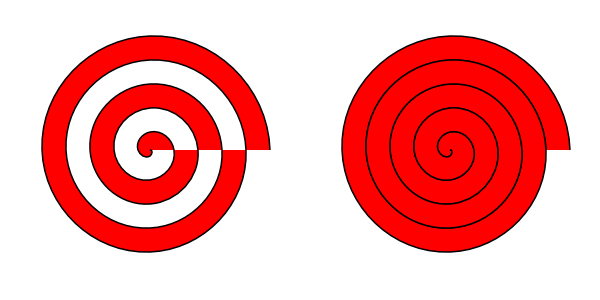 To reverse the direction of the spiral, flip it (Oggetto → Rifletti Orizzontalmente (H) or Oggetto → Rifletti Verticalmente (V)). Spirals can be reshaped by either dragging handles (small diamonds) on the spiral or by using the settings in the Controlli Strumento when the Strumento Spirale is selected. 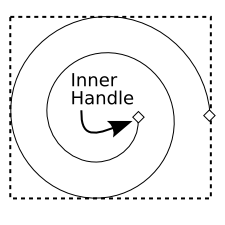 There are two handles, the Inner and Outer. Dragging either handle allows rolling and unrolling the spiral from its respective end (i.e, making the spiral longer or shorter, or changing the radius of the inner and outer ends). Holding down the Ctrl key forces the end to be at a multiple of the Scatto di angolo di rotazione with respect to the center. Holding down the Shift key while clicking on the Inner handle will set the inner radius to zero. A spiral showing the Inner and Outer handles. A spiral after unrolling one turn with the Inner handle. The Inner handle can also be used to change the divergence of the spiral by dragging the handle up or down while holding down the Alt key. The divergence is a measure of how rapidly the radius changes with respect to the angle as the spiral progresses. 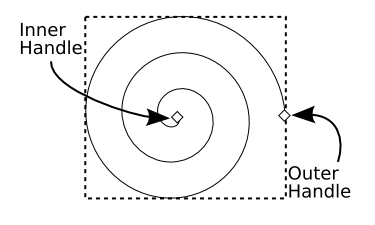 A divergence of one gives a spiral where the distance between successive turns remains uniform (an Archimedes' Spiral). Divergences smaller (larger) than one give a spiral where the distance between successive turns decreases (increases) moving outward. Mathematically, the radius of a point is proportional to its angle (measured in radians) raised to a power equal to the divergence. Clicking on the Inner handle while holding down the Alt key will reset the divergence to one. A spiral with a divergence of 2. A spiral with a divergence of 0.5. The Outer handle can be used to scale and rotate the spiral by dragging it with the Shift key pressed. 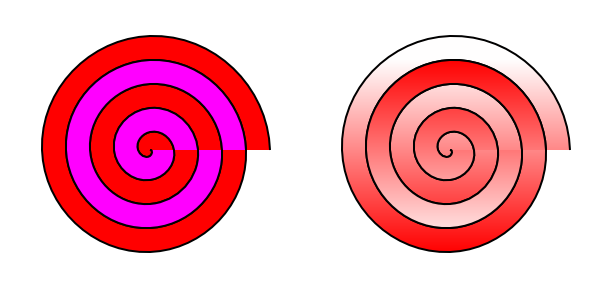 If both the Shift and Alt keys are held down, then the spiral will only rotate, keeping the radius fixed. The number of turns, divergence, and inner radius can all be set in the Controlli Strumento. These values can also be reset to their default values by clicking on the Defaults button ( ). To understand the Riempimento of spiral one must understand how Inkscape calculates Riempimento. This is covered in detail in Capitolo 10, Attributes. A spiral is basically an open path. The Riempimento is drawn as if the path was closed with a line-segment between the path ends (the Inner and Outer handles). Then the current Fill Rule is applied. Even-odd fill rule (left). Non-zero fill rule (right). How do you completely fill a spiral with the Even-odd fill rule? The trick is to use a second duplicate spiral, with one less turn (drag Outer handle to unwind the spiral one turn). Two overlaid spirals, both with an Even-odd fill rule. Solid fill (left), gradient fill (right).